The Paderewski Lecture-Recital is the flagship event of the Polish Music Center at USC. The Paderewski Lecture series was initiated in 2002 by then PMC Director Dr. Maja Trochimczyk. This annual event commemorates Ignacy Jan Paderewski (1860-1941), a pianist, composer, politician (the first prime minister of independent Poland after WWI), humanitarian, and orator, who was greatly acclaimed as a virtuoso musician and a statesman. Simultaneously, the Lectures spotlight current achievements of Polish music by presenting composers and musicians of international stature to the American public. Over the past decade, the PMC has highlighted such composers as Zygmunt Krauze (2002), Stanisław Skrowaczewski (2004), Marta Ptaszyńska (2005), Krzysztof Meyer (2007), Wojciech Kilar (2008), Henryk Mikołaj Górecki (2009), Krzesimir Dębski (2013) and Elżbieta Sikora (2016). We have also celebrated important anniversaries of such composers as Zygmunt Stojowski (2006), Ignacy Jan Paderewski (2010), and Andrzej Panufnik (2014). 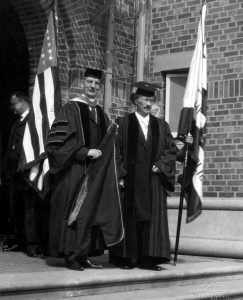 The selection of Paderewski as the patron of the lectures held at USC highlights both his role in California and his connection to the University. This eminent composer-statesman received an honorary doctorate in 1923, from the School of International Relations at USC. During the event held at Bovard Auditorium, Paderewski made a speech, but did not perform; a music program was presented by an international array of artists. Participants in this celebration included USC deans and faculty, representatives of Polish-American Community, musicians and a patriotic organization called the Native Sons of the Golden West. The audience consisted of USC faculty members and students, the diplomatic corps from L.A. area, journalists and the general public. The Paderewski Lecture-Recital is held on the USC campus every year, generally in October. More information about the lecturers and programs of each year may be found at the link below. See a full list of all Paderewski Lecture-Recitals by year here. The Paderewski Monument at USC was officially unveiled on 4 October 2007 in conjunction with the 2007 Paderewski Lecture-Recital. The momentous occasion drew a crowd of 200 patrons of the monument project, officials, and other guests. Ambassador to the United States, His Excellency Janusz Reiter, and University Provost (now USC President), C.L. Max Nikias, did the honors of officially welcoming the figure of this great man back to campus. The unveiling of the Paderewski monument at USC marked an important milestone for the Polish community in Southern California. Paderewski is the first Polish national to be recognized with a monument in this part of the world, where his links to the West Coast are considerable. Most importantly, Paderewski’s patriotism, incredible generosity, years of tireless efforts and considerable self sacrifice, secured Poland’s freedom after World War I. 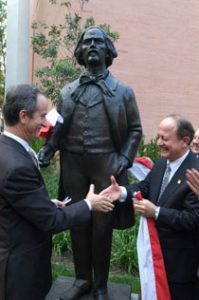 In recognition of Paderewski’s role in Poland’s modern history many individuals and institutions came together to support the initiative of placing Paderewski’s statue at the USC Thornton School of Music. The Polish Music Center, along with our fundraising partners—the Consulate General of the Republic of Poland in Los Angeles, Polish American Congress, Polish American Historical Association, and Polish National Alliance—gratefully acknowledge the generosity of the Polish American community in this endeavor. The Monument can be found between the Raubenheimer Music Faculty Building and Booth Hall on the USC University Park campus in Los Angeles (see map). A full public accounting of the monument’s expenses and donations is available here.